The IP Casino Resort Spa, owned by Boyd Gaming, is one of the preeminent gambling destinations east of the Mississippi River. 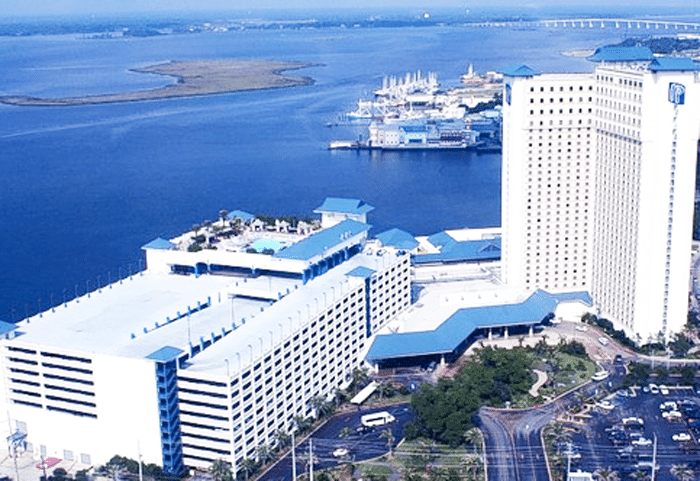 It was founded as the Imperial Palace Hotel and Casino Biloxi, but – while the property still feels plenty regal – its name was shortened to match its modern theme and amenities. The most modern of these, of course, is legal sports wagering, which is finally live in Mississippi. This IP Casino sportsbook review seeks to shine a little light on this hot new commodity, and you’ll be pleased to know that the experience lives up to its billing at this world-class venue. The IP Casino sportsbook offers some of the best wagering opportunities in Biloxi, bar none (or, perhaps more aptly, BAR three?). As home to the second tallest building in Mississippi, the IP Casino’s hotel tower really stands out, just like its new sportsbook. This venue, simply called the Sportsbook, offers all the single-game sports betting action you expect, and the sports betting lounge at the IP really stands out as one of the best places to bet on sports in Mississippi. Read on to see what exactly makes the IP Sportsbook so special! When Did The IP Sportsbook Launch? The state of Mississippi effectively legalized sports betting at area casinos in 2017, about a year before the Supreme Court struck down the federal sports betting ban called PASPA (the Professional and Amateur Sports Protection Act of 1992). Once that happened, it was a race to open the first brick-and-mortar sports betting site in the state. While the IP Casino wasn’t first to market, it was a close third, opening its doors on August 3, just two days after the state’s first two books went live. Where Is The IP Sportsbook Located? How Old Do I Need To Be To Bet At The IP Sportsbook? In order to legally bet at the IP sportsbook, you need to be at least 21 years old. This is a Mississippi state law, so there are no exceptions. While most legal MS overseas sportsbooks will accept players as young as 18, when your state has explicit gambling ages on record, it is always advisable to go with these. As such, whether you wager at the IP sportsbook or use an overseas sports betting site over the Internet, you’ll need to be at least 21 years old. But don’t worry – it’s worth the wait! Does The IP Sportsbook Offer Full-Service Sports Betting? Absolutely! Indeed, if the IP sportsbook offered anything other than full-service sports betting, it’s unlikely that we’d even bother writing about the place. But since we’ve got this IP Casino sportsbook review published, you can rest assured that the excellent service will take just about any wager you can imagine. With a full menu of single-game betting action on every major US and international sport (college football, NFL football, baseball, hockey, basketball, soccer, cricket, rugby, tennis, golf, MMA, and more), you’ll have hundreds – if not thousands – of chances to win big every single day of the year. From spreads and straights to props and futures, the sportsbook at the IP Casino Biloxi has it all! Currently, there is no mobile wagering at the IP sportsbook in Biloxi. However, that’s because most MS casinos are taking their sweet time to roll out the product, perhaps due to their waiting on the state legislature to pass an expanded online sports betting bill. You see, as things currently stand, MS sports betting venues can only offer mobile betting apps for customers to use on the property premises themselves. A new bill has already been proposed to extend this wagering to anyone in the state, though it could still be some time before such a law is passed. Until then, if you live far away from the IP sportsbook, you can simply use a legal offshore sports betting site that isn’t geo-fenced at all. An estimated 500,000 Mississippi residents do exactly that, in fact! Live betting, aka in-game betting, is the newest thing in the sports wagering world, and like the IP sportsbook, it’s here to stay. Live betting at the IP sportsbook has been live from Day One, offering patrons of the venue the chance to wager on dynamic game odds in real-time. Live betting odds are similar to traditional odds, except for the fact that bettors are able to place wagers on changing lines all game long. These lines reflect the ebb and flow of any given matchup’s action, and live wagering has proven to be a real game-changer in the sports betting world. With live betting running smoothly, this IP Casino sportsbook review has no choice but to award the venue – and the experience – an A+ rating! What Promotions Are Available At The IP Casino Resort Spa Sportsbook? There are tons of promotions that are rotating in and out of the IP Casino Resort Spa. The casino also has a couple of promotions that will always be available for customers. If you are 50 years old or better, you can take advantage of the Young At Heart promotion. There are hot seats, buffet specials, and drawings just for you on Mondays and Wednesdays. During the month of your birthday, you can earn 25 Tier Credits in one day and you will be able to receive a birthday t-shirt or a free buffet. There are plenty of other rewards as well so make sure you ask the friendly staff what promotions you can take advantage of. How Can I Sign Up For The B Connected Rewards Card? Signing up for the B Connected rewards card is easier than it has ever been because you don’t even have to be at the Spa to sign up. You can go online to sign up easily. There are five tiers you can have with the B Connected card. You can get the best room rate guarantee or you can even get an annual trip to Hawaii plus $500 airfare credit toward the Hawaii trip. This program really knows how to take care of their members! Can I Parlay My Bets At The IP Casino Resort Spa Sportsbook? You can parlay your bets at the Ip Casino Resort Spa sportsbook. What that means is you attach a different number of bets into one wager. You bet on the results of multiple games and if you are right on all of them, you will win more money than you would have on individual bets. But if one of your bets fails to hit, even if it’s the last game, then your parlay wager will not pay out. If you are wondering about how many games you can parlay, make sure you ask the IP Casino Resort Spa sportsbook representative for all the details.